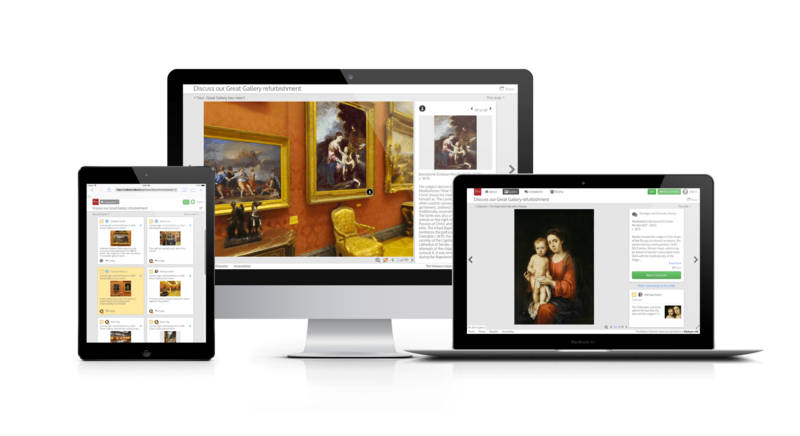 Wallace Collection: online visitor engagement -virtual access to the Great Gallery. What: Immersive virtual tour during major refurbishments. Result: Stickyworld staff designed and executed a digital tour of the gallery, allowing for greater engagement from visitors and a unique experience while the gallery was closed. "The technology has helped us to think differently about how we present our digital content and has provided our visitors with a new way of engaging and communicating with us." Phoebe Harris, Head of Collections Service at the Wallace Collection said of the project. 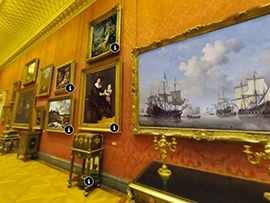 The Wallace Collection in central London closed its Great Gallery for a major refurbishment in 2012. The education and digital archive teams created a Stickyworld to keep the gallery open and invite comment and discussion about the refurbishment from an online audience. As part of a winning ICTomorrow challenge, Stickyworld’s project team helped build a virtual tour, presenting an immersive experience of the gallery space and linked to the art collection that had been placed into temporary storage. The director of the Gallery introduces the project in a simple video which you can see below. The project was one of the first of a series of cultural engagement projects. To learn more about this kind of application or similar case study projects, book a free webinar demonstration and discussion.